While simulation engineers are enjoying the powerful and unlimited computing power provided by Rescale, their productivity is further increased by having remote desktop and visualization capability in the cloud. Via a standard Internet connection, Rescale's customers can access their 2D/3D desktop applications or remotely visualize their simulation results with interactive performance. Perform remote visualization in the cloud via a standard Internet connection. Visualize simulation results anywhere and at anytime. Interactive and high performance visualization with accelerated 3D-graphics are further enabled by NVIDIA GRID™ and NICE DCV technology. Remote visualization technology is capable of accelerating broad applications from many vertical industries including manufacturing design and simulation, oil and gas seismic analysis and interpretation, medical and scientific simulation, and semiconductor design and simulation, among others. Access desktop application commands and controls. Interact with simulation software graphical user interfaces (GUI) and 3D visualization results in the cloud. 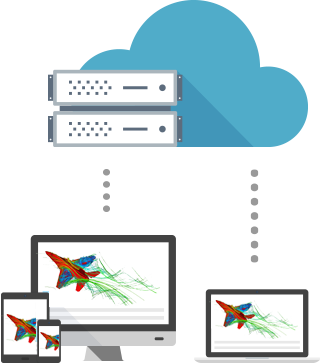 Rescale's cloud simulation platform provides uninterrupted visual computing from pre-processing, to solving, to post-processing. No need to download large simulation output files to your local system. 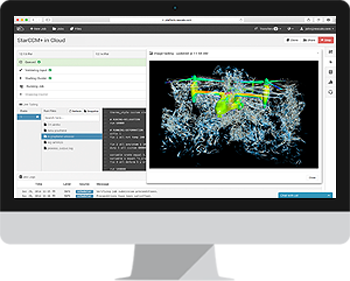 Enable a full desktop and simulation cloud experience with accelerated computing and visualization. Shorten project deadlines and accelerate the time-to-market.